Acquired: Signed as a free agent January 21, 2019. 2018: Signed as a free agent with Calgary Stampeders May 4th. 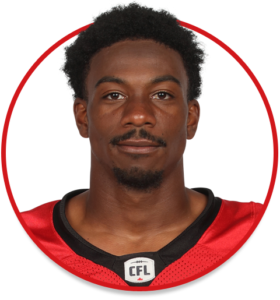 Released July 24th…Signed with Ottawa Redblacks September 29th. Played in 4 games. Recorded 14 tackles and a forced fumble. Released November 26th. Playoffs: Was on Ottawa’s practice roster for the East Final and the 106th Grey Cup. College: Played three seasons at Notre Dame (2013-15). Redshirted, then transferred to Syracuse for the 2017 season. Appeared in 37 games with the Fighting Irish and 12 at S.U. Personal: Attended Gonzaga High School in Washington, D.C. Played defensive back, receiver and returned kicks at Gonzaga. Played for USA for their U-19 at the 2013 International Bowl.